Will easily float a small dog. 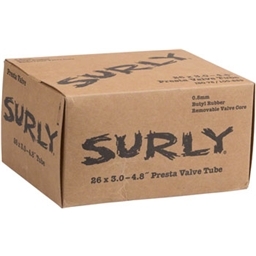 Labeled Size: 26" x 3.0" - 4.8"
Product: Surly Fat Bike Ultra Light Tube 26 x 3-4.8"
I bought two and mounted tires and inflated in order to get my tires nicely rounded (I let them sit for 2 weeks) prior to converting them to tubeless (this helped VASTLY!!!). And now I have 2 back up tubes! Easy to install, works as designed. Read all 8 customer reviews of this product. 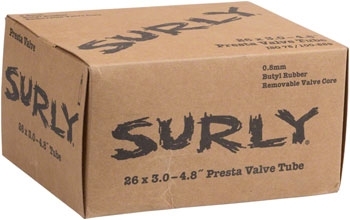 Reviews of Surly Fat Bike Ultra Light Tube 26 x 3-4.8"